Usually I'm the one throwing the parties, but since I'm out of town this week+weekend (PHILLY! ), I'm not having a Halloween bash. Instead, one of my friends asked me for partying planning advice and I was happy to whip up an inspiration board for her. Her daughter turns 14 on Halloween (how cool is that?) and she wanted to have a Halloween Movie Marathon party (I was specifically told not a slumber party because she's 14, ahem). So Kayla, happy early birthday (the party is tonight!) and hope you like your party! Click links to learn more! 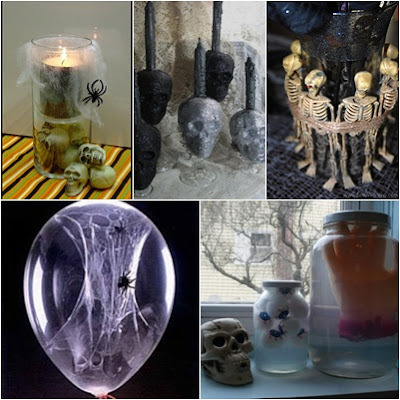 It's all about creating a spooky atmosphere and setting the mood. To keep it creepy, keep the lights off (minus the tv and I'm sure cell phones will be a glowin') and use candlelight, glow sticks, and blacklight. Can't trust kids around candles? Twinkly lights, glow sticks, glow-in-the-dark paint or LED candles also could be used. This spooky web candle is really easy to make. For a more macabre option, try these skull dripping candles. Wrap a vase in tiny skeletons, and stick black roses and lights inside. It's a birthday after all, and what birthday doesn't have balloons? I'd add glowsticks inside these spiderweb balloons. My fave idea is to stick fake body parts in jars of tonic water. The tonic water glows under blacklight! For food, Mom's ordering pizza (Kayla's request) and having birthday cake, but the girls still need some movie snacks. I like my parties to have a signature drink, and this party will have Vampire Punch--the drinks listed have alcohol, but simply leave it out. Add some dry ice to be even creepier.And don't forget, tonic water glows! Bonus tip: Stick a small glowstick or glow bracelet in the bottom of a clear, plastic cup. Stack another cup on top and viola, glow-in-the-dark cups! 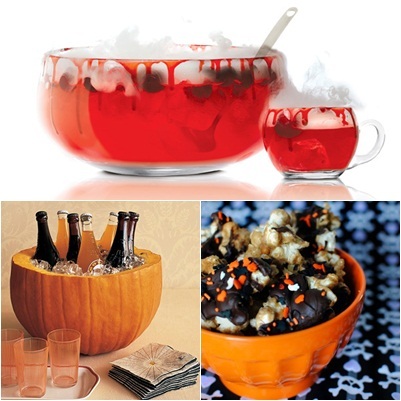 Soda and water keep cool in pumpkin ice buckets. I'd have the bucket backlit with candles or flickering LED lights (flameless candles). Salty and sweet go great together, and popcorn and candy are staples of movie-viewing, so this Halloween popcorn is the best of both world. Lots of ideas on that link, btw. Need horror movie ideas? Check out this site. For another birthday activity, try these Halloween nails! Have a spooky and safe weekend! Attending any Halloween parties this weekend? What's your favorite scary movie? They terrify me! Psst: Want a TREAT that's not a trick? Enter my Sift! Dessert giveaway. Love the boards....have fun in Philly!!! Your parcel should be on it's way to you! I hope it gets there in time, and I hope you like it! I'm throwing a party next weekend - sadly I'll still be in Fort Worth this weekend so no actual Halloween weekend party for me! Great inspiration! I love Halloween parties and went to one last weekend. how fun! so cool for a birthday. OMG this is by far the post about Halloween entertaining!! Someday I'm gonna steal all these ideas! Great ideas!!! I'm a total wimp when it comes to scary movies! The spiderweb balloon is AWESOME!! Some friends and I are going to do a scary Halloween night. I'm not really a fan, but you're inspiration board looks great! Tonic water glows?! I never knew that! I wish you a good halloween day!! These are fabulous ideas!! The spider web balloon is so creepy and cool at the same time. Have a great weekend in Philly! The pumpkin ice bucket sounds fabulous! Hope you have a lovely weekend dear! I have to save this post for next year! Have a great time in PA! Love your nail ideas! I missed that post so thanks for linking again. Fabulous ideas! And how fun is it to have your bday on Halloween!! :) Happy B'day to the birthday girl! love this festive post! The Vampire punch looks awesome! Wow, these ideas are great! The vampire punch is amazing... you are so creative! Have a great time on your trip. Greta ideas. Great tip about tonic water. I had no idea. Hope you are having a great time in Philly. Great post! I love the inspiration!